At the end of April 2017, deepsense.ai released a new version of Neptune, the DevOps platform for data scientists. Neptune 1.5 introduces a range of new features and improvements, including support for Python 3, simplification of Neptune CLI, offline execution, compact view, improved channels and charts, and a number of improvements in the user experience. One of the most upvoted tickets on our feedback channel has been requests to add support for Python 3. Well, we put your request on our roadmap and now, using version 1.5, you can run Neptune experiments using both Python 2.7 and 3.5. We encourage you to stay active in our feedback forum and vote for features you need in your data science work. This is how you will influence where Neptune goes and how it develops – and ultimately make it more convenient for you. Until now, Neptune CLI’s commands were long and complex. With version 1.5, however, convenience has taken center stage as we’ve introduced a host of improvements and simplifications. Click over and have a look at the simplified CLI commands and configuration file in our documentation. To see how this change could work for you, compare the commands for running our “Flower Species Prediction” example. Our users often run parts of their experiments using Jupyter Notebook, but the Neptune client library requires communication with our server. Thanks to offline execution, users can disable communication with the server and run their experiments without CLI. Read more about this convenient development here. To make comparing your experiments easier we have introduced a compact view of the experiments table. You can now display more experiment results on your screen, and draw conclusions even faster and more confidently. Neptune 1.5 comes with the new API for channels and charts. Thanks to the new API you will be able to send and display even more data points. Your charts will load faster and more seamlessly. We encourage you to give the improved channels and charts a go. We are already working on the next version of Neptune, which is slated for a May release and will focus on better displaying the experiments list. We hope you will enjoy working with our DevOps platform for data scientists. 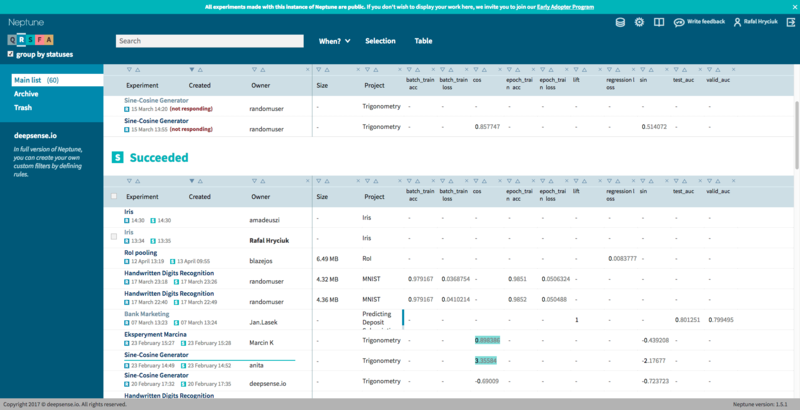 Neptune 1.5 will help you manage and monitor your machine learning experiments even more conveniently. Would you like to test drive Neptune? Visit NeptuneGo!, have a look around and run your first experiments.